I have to admit that I entered Flowtoys for this year’s Inc 5000 in part because it’s our 10 year anniversary and I thought it would be a nice feather in our cap. I also have to confess that we probably won’t make it next year, as we are currently at a growth plateau and we’re ok with that. The first 7 years of Flowtoys we doubled in revenues every year, but that’s not hard when you start from close to nothing. We made it through the 2008 recession, though we didn’t have the kinds of challenges that established companies with a lot more momentum experienced, when free-flowing capital came to a grinding halt around the world. Back then, it was still just Sean and Prisna with a little help from our friends, serving a small and emerging global niche market, so we weathered the storm like a leaf floating down a torrent. But back to being an impostor. 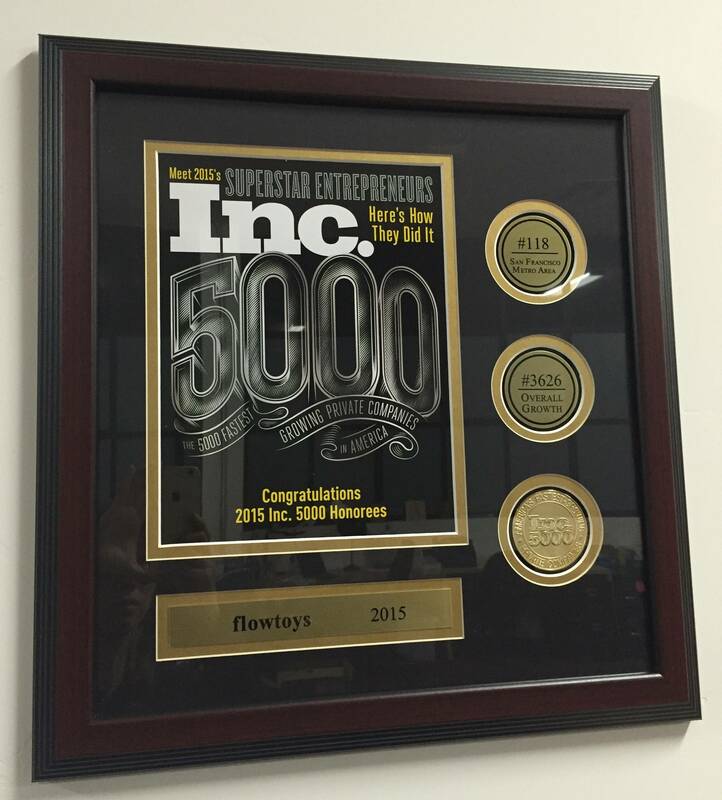 The Inc. 5000 list celebrates “growth” only with regards to revenue growth over a three year period. It does not consider profitability, financial sustainability, let alone culture, environmental responsibility or contribution to humanity. 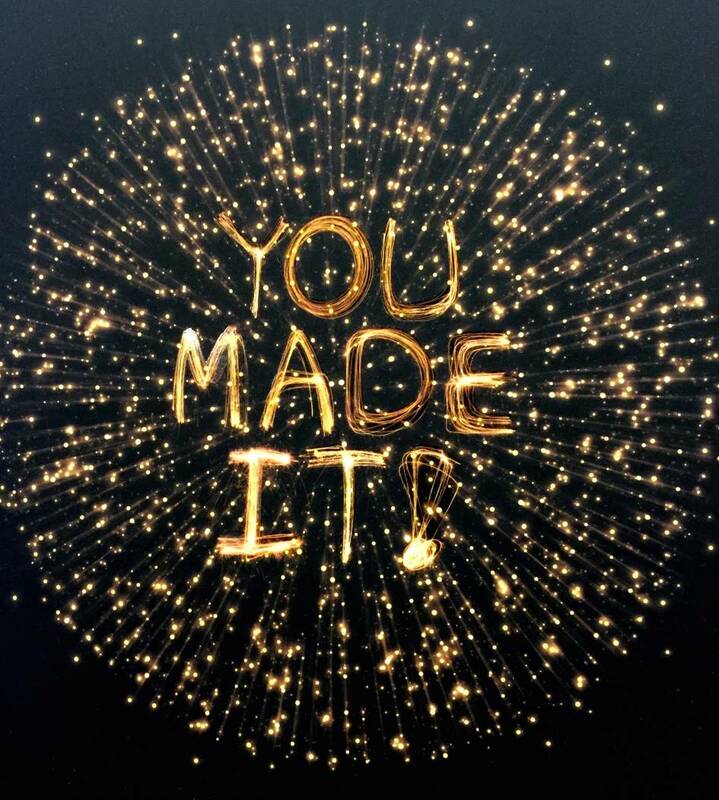 Since having made the list, we’ve received dozens of solicitations from other companies opening with “Congratulations, you made the Inc. 5000! Now let us tell you about how our company can help make your company grow…” Don’t get me wrong, it’s not like we fear growth or money (ok I admit, I’m a little afraid of large gobs of money. Some day when I’m ready to direct that sort of energy, the universe may see fit to let it flow our way). However we do harbor some pretty odd and old-fashioned ideas about what constitutes growth. What does growth mean to us? Flowtoys was born from Sean’s love of making things, solving problems and serving needs. Flowtoys was also born of Sean and Prisna’s love of firedancing, exploring movement with props, and desire to share the passion. It was forged in the crucible of burning man, spinjams, and seeding flow communities. Of transformational festivals, visionary art, conscious choices, and contemplating the meaning of life. Essentially “growth” for flowtoys couldn’t just mean revenues; it had to encompass and add value to all the other elements that catalyzed our existence. In the early years, we didn’t just make flow props. 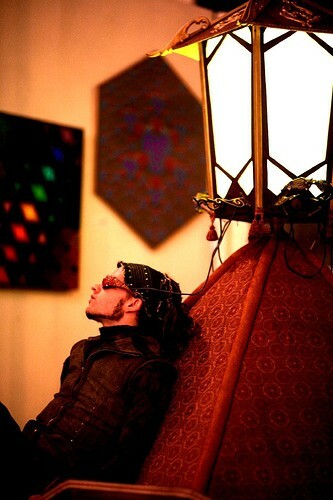 We performed all over the world, created immersive environments, got a Burning Man art grant and blew tens of thousands of minds (literally), we organized theme camps and lived in a warehouse that threw parties way too often. Ahhh the early years, they were fun. We worked hard and played hard, we bootstrapped our way with our inherent frugality, made lots of friends and had a ton of adventures. Anyone with business sense (family members, community mentors) were puzzled at the way we did things. They advised us to focus, delegate, outsource, clarify our value proposition, and segment our market. They were right of course, but we took the long and winding road of discovery. And we have no regrets. The view was better and there was a lot less traffic. After awhile it became apparent that flowtoys as a company needed more attention than a couple of high-octane hippies could give, while being pulled in a million directions. So we moved out of San Francisco into a quiet neighborhood across the Bay in Berkeley, and began our slow road to focusing on providing flowtoys to the world. 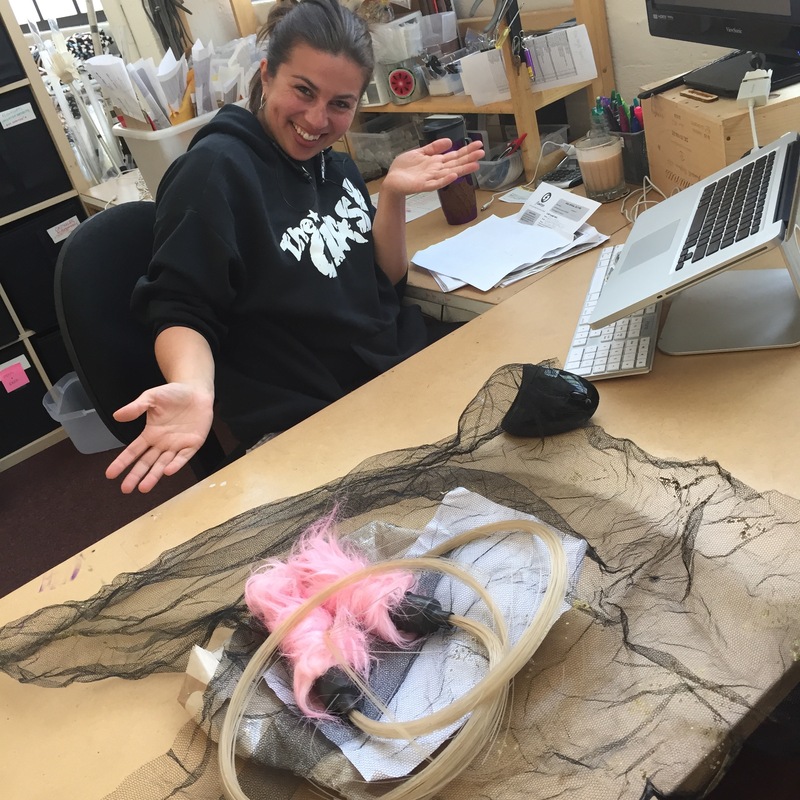 DIY, upcycling, creating spaces: As Flowtoys continued to grow, we moved out of our living room and got a small warehouse a few blocks away. It was a rat’s nest. Sean and I spent many mornings pouring over sketches and optimizing plans. Sean was carpenter, plumber, electrician, upcycler-extraordinaire and obviously not focusing on flowtoys for many months. Our bathroom sink counter was an old server cabinet door (cheap! ), our worktables and shelves were upcycled office dividers (free!). We thought we were saving money then. In hindsight, we probably should have hired a contractor to take care of building out the warehouse, while Sean focused on product development. But now Sean can build anything better, and we appreciate the true value of our time. 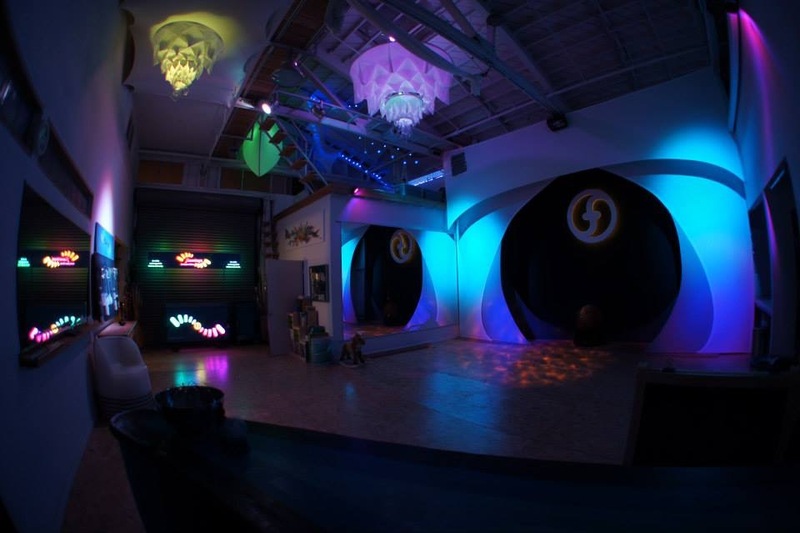 Flowspace 1.0 became a mecca, hosting numerous artists, musicians, and performers, and inspiring many flowspaces and flowdojos around the world. Can’t put a price on that. We still recycle and upcycle wherever we can. We’re still reusing and upcycling furniture and have never bought any of the 50+ office chairs that have come through our lives. We sort all warranty items, refurbish and recycle what we can, and save the rest for art projects. Practically every production station has a “art scraps for prisna” box. And I now have 10 years worth of warranty and production scraps for decking out the portals to the skylounges at the new flowspace – I can’t wait to get crazy with my hot glue gun, and breathe new life into old parts. Environmental responsibility: We are a product-based company. As someone with a steep environmental background, I struggle with this constantly. I believe our products bring immense joy and transformation to people’s lives, but they also expend resources and leave a footprint. To minimize this impact, we have design, production and operation principles that focus on resource and energy efficiency and waste reduction. We created the green flowlight to raise awareness on responsible e-waste management, are an e-Stewards Enterprise and a Green America Certified Business. We choose conscious materials that are better for human health and the environment, despite the cost. We also don’t believe in planned obsolescence, which is incredibly challenging for a product-based company. All flowtoys are designed to last a lifetime, be easily serviced/repaired and are covered by our industry-leading Forever Flow lifetime warranty. All of this add cost and keep us on our toes. Together with less-than-typical-margins, we can’t get sloppy about order and production errors and inefficiencies – we must run a lean and tight ship to stay afloat. Music and art: Where would we be without music and art? They have been integral to humanity’s evolution, and any human civilization that embraced music and art has been made richer for it. In the early days, we dipped our toes in producing music, and hosted several resident artists at the flowspace. Our first product – the flowlight – was released in a series of elements: fire, water, earth, air and spirit. 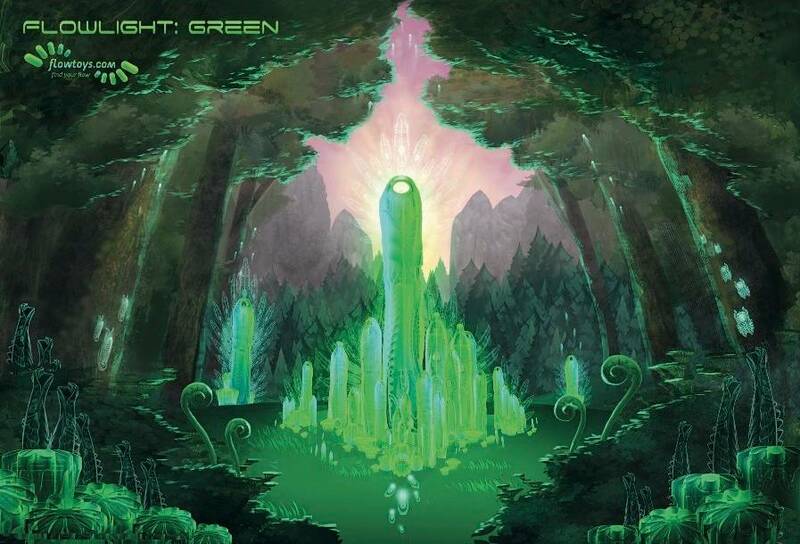 We created sigils for each element, and produced an elements music album, working with artist friends Xavi Panneton and Matt Ganucheau respectively. Who makes an LED glowstick, and creates art and soundscapes for it? We did. It probably didn’t make sense time or money wise. It was definitely distracting, but it also made for a much richer experience for us and our supporter, and our brand became stronger in the process. We’ve done a bunch more art and music projects over the years, and we just launched a Society6 shop to enable our fans to have more beautiful art in their everyday lives. Toy stories: Every product we develop has a story, a reason for existence beyond the obvious “product”. The flowlight was a deep-sea organism that sentient beings from the future engineered and cultivated as a light-emitting object for decoration and illumination. The flowlight even has breath and a heartbeat built into its light modes. 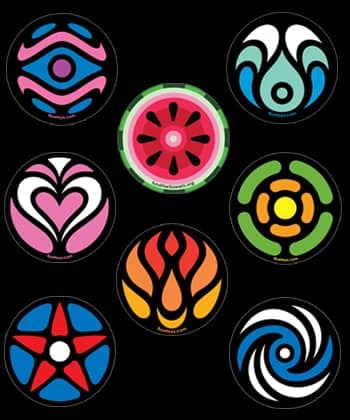 Podpoi evolved as a plant-like pod to contain the seed of light to propagate the artform that we love. Not by design at first, but the story emerged as a result of balancing the desired features and engineering challenges that shaped its form and function. I believe that stories provide a meaningful context that cradles the existence of our creations, and in doing so they bring life to their owner, and have a life after they have been passed on. Life begets life. “Stuff” just ends up in the landfill. Most of our products would not pass the return on investment test by most standards, but they are part of a larger vision to provide a more complete offering. The times we have ventured into the realms of easy money, we got bitten by sharks. Some people are very good at being sharks. Some people are very good at being pilot fish (useful to and hence not eaten by sharks). We are neither. We are good at making beautiful, thoughtful products that handle well and that people love to play with. We are also good at taking care of those people. In all honestly, we have not been able to focus as much energy on music and art these days. As our customer base grows, so do the demands on our time and resources to support them. And where would any company be without its customers? Customer care: We make electronics that are being spun around, slammed together, dropped and impacted at high speeds, often by high-energy people. Imagine doing that to your phone, or even a flashlight! We make flowtoys as durable as possible without compromising other important features like handling, but we recognize that nothing is indestructible, and we want our customers to feel free to play and explore movement without worrying about their props. 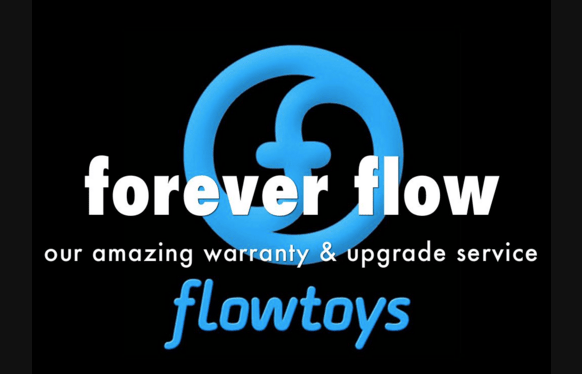 Our growth cannot come at the expense of our customers’ experience, and over the years we have refined our Forever Flow lifetime warranty to ensure that their investment in flowtoys is lasting. We take great care of our customers. No message goes unanswered (unless it was lost in e-space, which unfortunately happens – we are very sorry for those times.) We also have an incredible upgrade program, where you can return any flowtoy in any condition at any time for credit towards a new purchase. It would be a lot easier and cheaper to just replace things, no questions asked. But we believe it’s irresponsible to do so, if an issue can be fixed with education, troubleshooting and a little TLC. I’m proud to say that while our customer care team is small (2.5 elves), they are top notch, trained to educate and help troubleshoot, and they care deeply about the customers they serve. We get a lot of love in this department, which is financially unquantifiable, but it fuels us in our mission, so please don’t hold back on the compliments (or critiques, those fuel us to do better too). The first and most obvious trade-off of slow growth is that it’s sloooow. 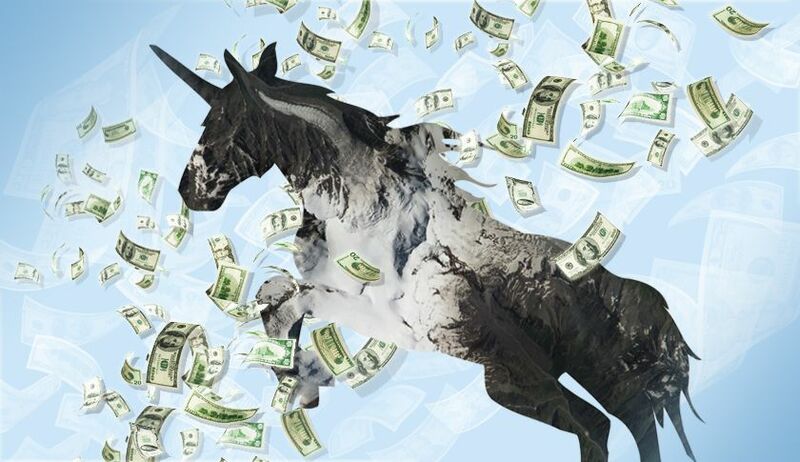 In today’s world of unicorn start-ups and billionaires-by-30, flowtoys is a total runt. That said, we have always been profitable. We don’t carry any debt, and we don’t have investors telling us how to spend our money, or release a product before it’s ready. In the early years, we reinvested our profits into product development, building out the first flowspace, and creating music and art. More recently, we are investing in building out the new flowspace, and providing better pay and benefits for our awesome staff. Another trade-off comes in the cost of profit margins and scalability. Choosing say vinyl over silicone would save us 10x in cost, but it’s toxic and we just can’t bring ourselves to go there. All the choices we make in how we want to grow – our customer care program, our focus on environmental sustainability, music and art, imbuing our products with stories and artistic context – can be said to distract us from the financial bottomline, and they definitely make it harder for us to scale in traditional ways. It takes a lot longer to train our elves than simply hiring a call center, or outsourcing our production. For better or worse, our culture of making meaningful things in small batches keeps us small. In the flow arts world, we are regarded as a giant, but in the “real world”, we are small potatoes. 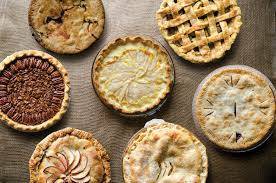 In order for us to grow and thrive as a company and better serve the world, we have to come up with creative solutions to grow the pie, while still maintaining high quality ingredients. We have come to recognize that efficiency and culture are often at opposing ends of a tether, and it’s a constant struggle prioritizing one over the other. 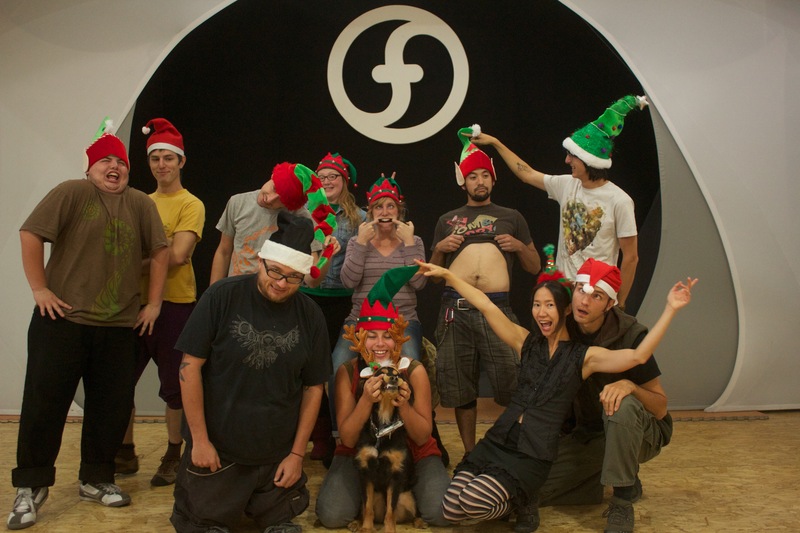 Everyone at flowtoys is high output, works fast-paced and efficiently. Everyone at flowtoys also loves art, music, good times and meaningful experiences. I think we do a pretty decent job of balancing the efficiency-culture tug-of-war, but it is a constant challenge. It’s hard to quantify happy customers, but that is a measure of success for us. We believe our job isn’t done until a customer has a peak experience with their flowtoys and shares that experience with their friends. Other companies in the flow arts world look up to us as models of success. We are honored, though we can’t truly celebrate our accomplishments until there are many more triumphant stories in the flow arts realm. When, like in yoga or popular sports, flow arts teachers, performers and practitioners can make a living practicing, performing and spreading their artform. When there are many more prop shops serving different niches and actively growing the pie, instead of competing with each other for ever diminishing portions of the same pie. We look forward to the day, where we are the high-quality micro-brew, and some other company is the budweiser of flow, because that would mean that the flow arts would have infiltrated the fabric of society. For us, that would be a sign of success. 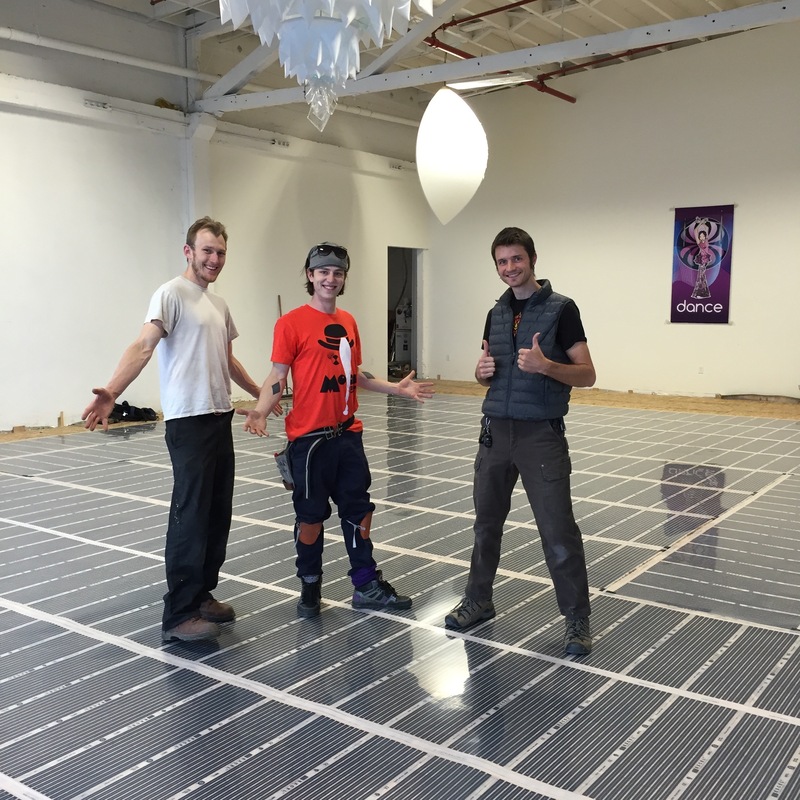 heated dancefloor freshly installed by jugglers Jeremiah Johnston and Brian Thompson – three thumbs up! We made it to ten years. 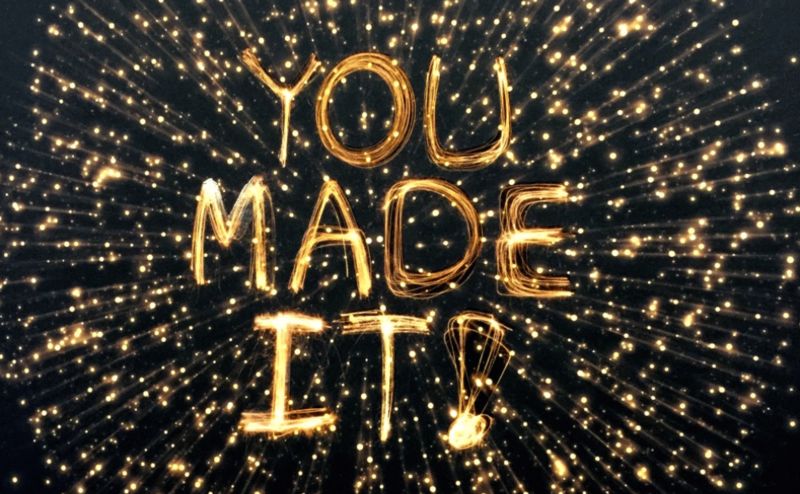 We made the Inc5000. What’s in store for the next 10 years? We moved into a larger warehouse space in Emeryville last year, and have been building it out to house a 2000 sq ft studio space, where we can make more inspirational videos, host workshops and meet-ups, and spread the flow arts. 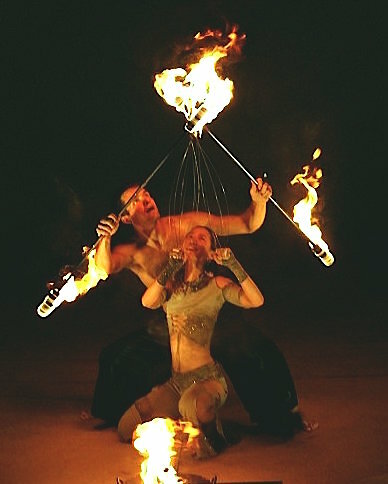 We are working on a retail shop for all things flow, fire and juggling – a great resource in the Bay Area as currently no flow arts or juggling company can afford the astronomical rents, but we are primarily a webstore, so we hope the retail shop will help grow and be of service to the local community. We value creating spaces and ecosystems, where human level interactions can thrive. PlantedDesign: a living walls company run by Amanda Goldberg, who will be helping bring life to the warehouse. We are also currently working on several new product lines that we hope will significantly grow the base of spinners around the world, and create more opportunities for awesome. We can’t leak too much info, but a couple of years ago we got a contract with a very large entertainment company to create some next level props for a parade on Main Street of their flagship theme park. It kicked our b*tts, but we learned lots and are applying what we learned to bring new and exciting props to the flow world. It’s been an incredible decade with so many adventures, so much learning, so many mistakes and challenges, especially in getting to know ourselves as people, and refining our values as a company. I don’t know how today’s start-ups do it, going from 0-60 in a blink, but I’m glad our story-to-date has been spread out and savored over 10 years. One thing is for certain, we could not have done it without our customers, supporters, fans, friends and family. The story of flowtoys is inextricably tied to serving your needs, responding to your ever-evolving requests, and experiencing your smiles. Thank you from the bottom of our hearts – our deepest gratitude to you all.